Random Thoughts of Gil Camporazo: What You Do Will Always Come Back To You! Evil couldn't triumph over the good. What has been planned to destroy the good, will always go back to the evil plotter. Good works are always rewarded. While I was about to go home, I took time out reading the Bible from the Book of Esther (Chapters 1 to 8). This Book tells about the good deeds of Mordecai, the queenship of Esther, dethroning of Vashti's queenship, Haman's evil plan, and the wisdom and goodness of King Ahasuerus. It started with the royal feast offered by King Ahasuerus for his princes all over the provinces and to the people of his kingdom. And Vashti the Queen made a feast also for the women in the royal house of king Ahasuerus. King Ahasuerus wanted the queen to be presented to the people and the princes for she was beautiful, but she refused to go. The King was embarrassed before his Royal visitors made a decree that Queen Vashti be stripped off of her queenship. A decree was issued by the King calling all fair, young virgins in the province to replace the queen. Esther, the daughter of Abihail, Mordecai's uncle, and whom Mordecai raised her up since childhood for she was an orphan, was sent off to join the search with a counsel not to divulge that she's a Jew. 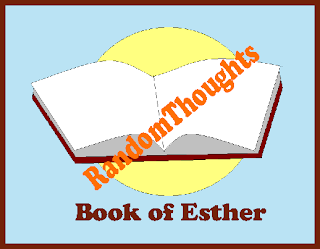 Out of so many beautiful ladies, Esther was chosen by King Ahasuerus as the new queen to replace recalcitrant Vashti. Mordecai used to stay at the king's gate and spied what was going on with her niece Esther. He overheard the two chamberlains of the King, Bigthan and Teresh, the door keepers to conspire in slaying the King. Morcedcai secretly told Esther who also told the King about it and made Mordecai's name known to the King. The King had it investigated and found Bigthan and Teresh guilty and hanged them to a tree. From that time on, Mordecai's deed was recorded in the book of chronicles. Haman was promoted to take charge of all the princes. One day while he was passing the king's gate, he noticed that a certain Jew, Mordecai didn't show respect to him by not giving him a bow. Haman got angry. He cursed Mordecai and all the Jews. He requested the King to issue a decree, declaring all the Jews to be an enemy of the king and they will be destroyed. The king bid his request. Zeresh, Haman's wife suggested that a gallows should be put up in the ground near their house to hang Mordecai. Haman consented and the gallows was built. Mordecai knew this and wanted to tell Esther the Queen. Through Esther's maid, Hatach, Esther was informed of the evil plan of Haman. Esther wanted to tell the King about this. She ventured to see the King without the latter's permission. She was lucky that the King allowed her to enter the palace and let her touch the scepter as a sign that she would not be put to death. She told the King of her plan to have feast in which Haman is invited and the King too. The King approved it. Haman was informed about the feast. He was very glad to know it that the queen invited him as a special guest. He dressed so well and prepared for the feast that day. However, he ordered by the King to fetch Mordecai and clothe him and gave him horse. On the feast day, Esther made an announcement about the evil plan of Haman to Mordecai. The King dug up Mordecai's record as it was recorded in the book of c The King got angry with Haman. He stood up and proceeded to the garden. Haman followed him and asked for forgiveness. But the King didn't listen to him. The King got back to the banquet table. Esther told the King more that there's a gallows prepared to hang Mordecai at the backyard of Haman. The King ordered Haman to be arrested and hanged to the gallows which Haman prepared. Haman met his fateful day. Mordecai was called by the King and gave him honor and took charge of the house of Haman for his good deeds and saving the life of the King. The King Ahasuerus recalled the decree calling for the destruction of the Jews. Evil won't always prevail. Good deeds are always rewarded. I also believe that good deeds are eventually rewarded even not in an instant but it does gets its apt reward in due time. What goes around comes around. And even if we're not rewarded in this life, we will in the next. Thanks for an inspiring story!